Battery-Powered Radio : A small radio can receive weather updates and emergency broadcasts. Pack extra batteries, or use a hand-crank radio, instead. Light Source : Pack multiple flashlights and many spare batteries. LED flashlights are more expensive than “older” flashlights, but won’t lose battery power as quickly. Pack candles and matches, as well. Water : Pack bottled water, storing larger bottles in a cool, separate place. Add several bottles of sport drink for variety, if desired. Food : Pack non-perishable food such as canned fruits and vegetables; protein sources such as peanut butter or canned tuna; crackers and cookies; nuts and dried fruits. Remember to pack a can-opener, if needed. Include plastic utensils, if necessary. Blankets : At least two blankets should be packed. Consider packing multiple sets of clothes, for different temperatures and seasons. First-Aid Kit : A proper first-aid kit should include antiseptic, bandages, aspirin, an ace bandage, and allergy medicine for allergic reactions. Emergency Contact List : Include a list of your local utility companies; phone numbers at which to contact friends and loved ones; and, your primary care physician’s number. 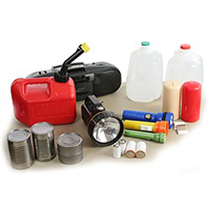 After packing your emergency kit, make sure to store it in an easy-to-reach location away from power lines, power sources, and any place that may be “extra dangerous” during a crisis. For example, storing an emergency kit in a garage or a shed may be safer than storing it in a basement or in a bedroom closet. In an emergency, a little bit of preparation can go a long way. Be prepared and be safe.